In the late 1990s Lewiston, Maine was in the midst of an economic downturn. The city of 36,000 was 96 percent white, and more than half of the Lewiston families with children under five were living at or below the poverty line. But that all began to change in 2001. Thousands of Somali refugees began arriving in the city. Over the course of the next decade, 7,000 immigrants from Africa arrived in Lewiston. 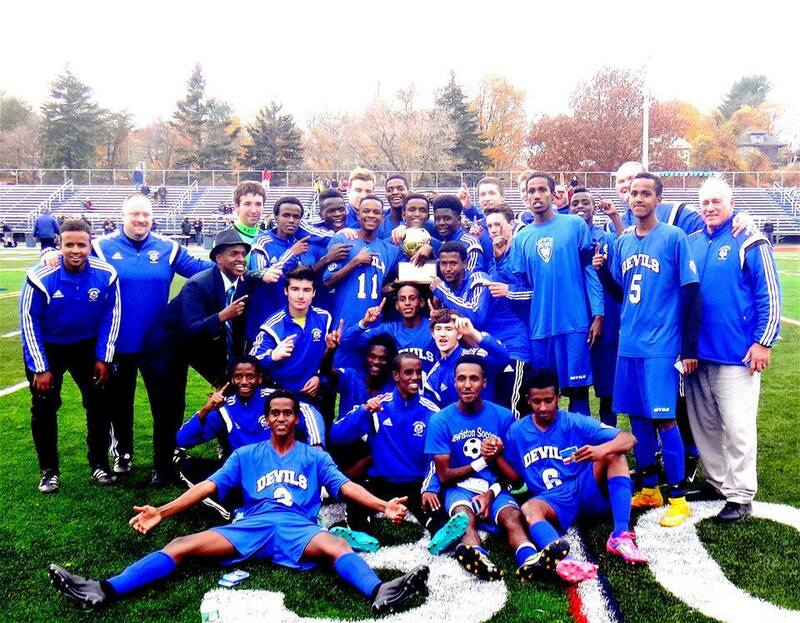 The intolerance changed due to an unexpected group: The Lewiston Blue Devils soccer team. 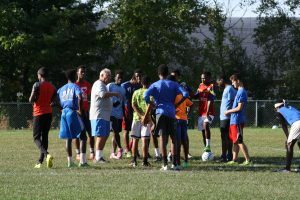 Coach Mike McGraw discovered many of the refugees had an incredible talent and passion for soccer. As they joined the team and won games, the city began to accept the presence of their new population. Amy Bass tells the story of this team, and the changing town in her new book: One Goal: A Coach, A Team, And the Game that Brought A Divided Town Together. Bass followed the team as they pursue the state championship for the first time in their history. She spoke with John Dankosky from Connecticut Public Radio about the book, the team, the town and how a sport crossed racial lines to unite a divided town. I think that change often creates tension, and I think that tension and change and hate and embrace, it’s all part of this story. I think it’s absolutely, such a fast migration and per capita, the numbers are sort of astounding. But Lewiston city administrators had been working on stabilizing Lewiston and figuring out new paths forward for a long time. … I think that having an influx of population was one part of an economic recovery, a social recovery, and a cultural recovery. It absolutely has painful moments, it also has moments of coming together. And [a] community is not just a statistic. Community is a feeling. And these are folks that were planting seeds and laying roots and wanted to stay. It had been a long time since newcomers had been in Lewiston with these kinds of future plans. And this was a new sort of community feeling for Lewiston to experience. It hadn’t had this in a really long time. The kids say something that I think is such a great life lesson to take away. And they’re almost dismissive about it. They say, “You know what? Coach doesn’t care where we’re from as long as we pass the ball.” And that’s their bottom line. Because that’s how they’re going to put numbers on that board and that’s what that goal is. So figuring out how to be together, how to play together, how to work the ball together down the field–they are very conscious that they’re serving as an exemplar for different parts of the community. I think that coming together doesn’t mean staying together. Community is really hard work and that doesn’t stop. Community is complicated and there’s coming together and there’s pulling apart and hopefully, there’s coming together again. Lewiston experienced something fairly wondrous at that state championship game in 2015. 4,500 hundred people were at that game, about 75 percent of them were rooting for the Blue Devils. That’s community… So they know what that feels like. They know what they want to get back to when there’s a pulling apart. I think that the best walk away from this is that Lewiston didn’t tolerate difference when difference knocked on its door. Lewiston in many capacities capitalized on difference. 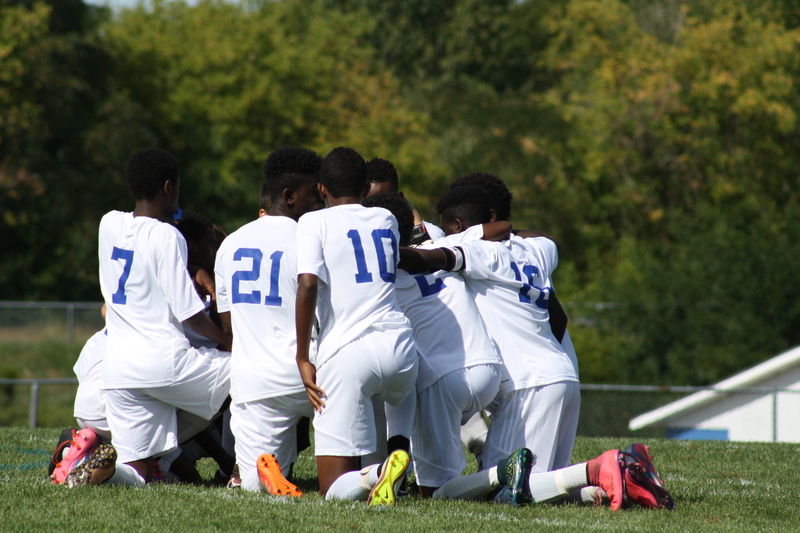 In terms of the soccer team, Mike McGraw capitalized on the talents of these new players, he capitalized on the community coaches they brought with him. He capitalized on the fact that Assistant Coach Abdijabar Hersi could yell to players on the field in Somali and Arabic completely baffling the other side. He capitalized on these talents and skills. And if you look at the school system and how the school system accommodated having a population come in, a low-literacy population a population that didn’t’ speak English, putting in the structures to help these students. This is a high school that improved its graduation rates while taking in a new population and figuring out how to accommodate a new population… So I think that one of the things that Lewiston figured out is that by accommodating new folks and figuring out what the community as a whole needs, the entire community can benefit. 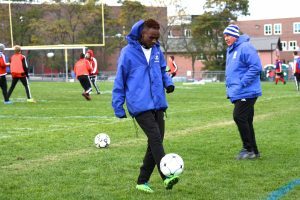 “Maulid’s love of soccer was typical of many Somali boys who came to Lewiston. Kicking a ball around barefoot in the camps, playing pickup games in Lewiston’s parks, were common experiences that bonded them. 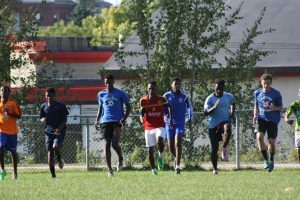 A group of young adults—Rilwan Osman, Jama Mohamed, and Abdikadir Negeye—wanted to capitalize on that bond, using it to ensure that they didn’t lose the next generation to American culture. In 2008, they formed the Somali Bantu Youth Association (SBYA), today known as Maine Immigrant and Refugee Services (MEIRS). As is common in most immigrant tales, refugee children lived between cultures, the typical generational divide made more profound by differences in language, dress, and food. How could Somalis successfully live in Lewiston, the founders of SBYA wondered, while maintaining their cultural identity? How could kids stay focused on family and education, rather than distractions like cigarettes, schoolyard fights and petty crime? Kids like Maulid are part of a 1.5 generation, a term used to describe immigrants who arrive in the United States at a young age. They learn the language and customs of the new country more easily than their parents; make friends; do well in school; and join sports teams. But they also subscribe to the traditions of where they came from. Because the Somali community arrived so quickly and in such large numbers, it could negotiate with its new environs, rather than entirely assimilate, thereby preserving critical aspects of its culture, especially religion. While living in tough neighborhoods on the outskirts of Atlanta, many Somali parents had feared the lure of baggy jeans and gansta rap. In Lewiston, however, they felt more in control, even as they rebutted neighbors—many of who were the children and grandchildren of French-Canadians who’d fought similar battles—who constantly asked, ‘Why can’t you be more like us?’ From language to food to religion, kids like Maulid kept a foot in two places, serving as the go-between for their parents as they forged a new identity. Each child had to learn American customs, while respecting and maintaining his or her Somali identity. In 2008, the SBYA called a meeting in the basement at Hillview Apartments, a subsidized complex where some Somalis lived. Alarmed by the number of Somali students written up for disciplinary action in school, as well as the rate at which girls were dropping out to get married, the group wanted to help kids and their parents successfully navigate life in Lewiston, making good choices and breaking the cycle of poverty that existed in the city long before they arrived. Integration, acculturation, and accommodation—as opposed to wholesale assimilation—were the keys. They started the meeting, remembers Negeye, asking kids what they needed. Homework help, they replied. Oh, and soccer. From the beginning, the SBYA’s motto for kids was to ‘help or get help.’ All were welcome, whether they needed support or could offer it. There was no money, everyone worked other jobs and went to school. Negeye, for example, worked at L.L. Bean while taking classes at Central Maine Community College. He felt bad about neglecting his family, but he wanted to make sure the Somali community had a stake in its future in Lewiston. The Lewiston Housing Authority let the group continue to use the basement for meetings, and they stored everything from files to soccer nets in Osman’s van. Their goal was to keep the kids focused and busy so they would stay off the streets, a strategy used by community organizations throughout the United States. Kids had to be respectful to stay on a team. Stay out of fights. No swearing. The Lewiston Police Department praised the organization for its work. Finding a field that the city would let them use required patience and money. 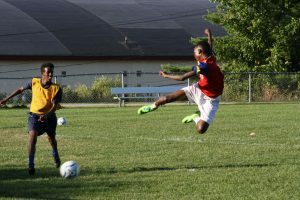 Soccer practice took place at what is now Mark W. Paradis Park, wedged among Bartlett, Pierce, and Birch Streets in the heart of downtown. When Maulid and his dad first played there, it was a grassy oasis tucked behind the apartment buildings. But as more kids discovered it, the grass died from overuse, and they nicknamed it Balding Park. This is an edited interview from the April 12, 2018 episode of NEXT. You can listen to the entire show right now. Find out when NEXT airs throughout all of New England.